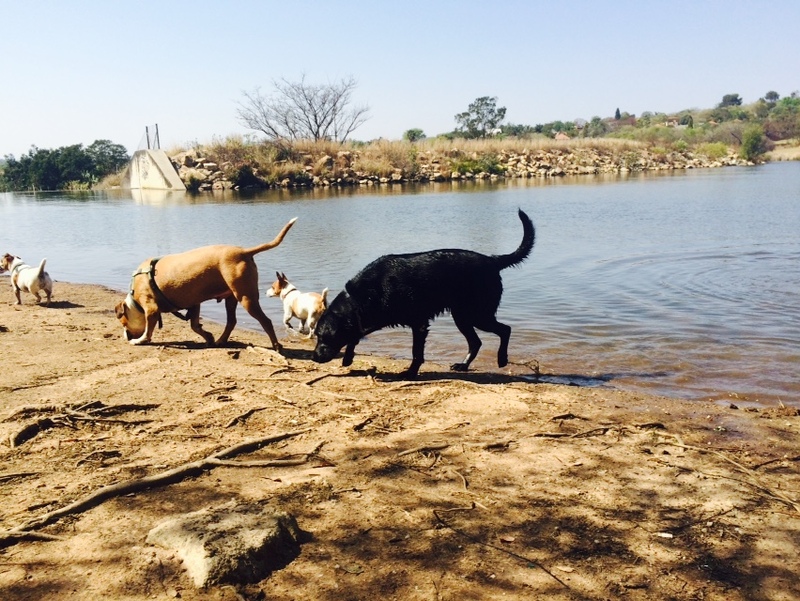 We were to go dog walking in Joburg, and went to fetch Duke the Pit Bull for his lovely bout of exercise. He was his usual calm self on the way to fetch Labradors Molly May and Sam. We weren’t sure yet if we should go to the park with these pups, but decided it was a good day to do so. Duke was let off his lead and immediately went off to explore the curious smells and sights of the park. 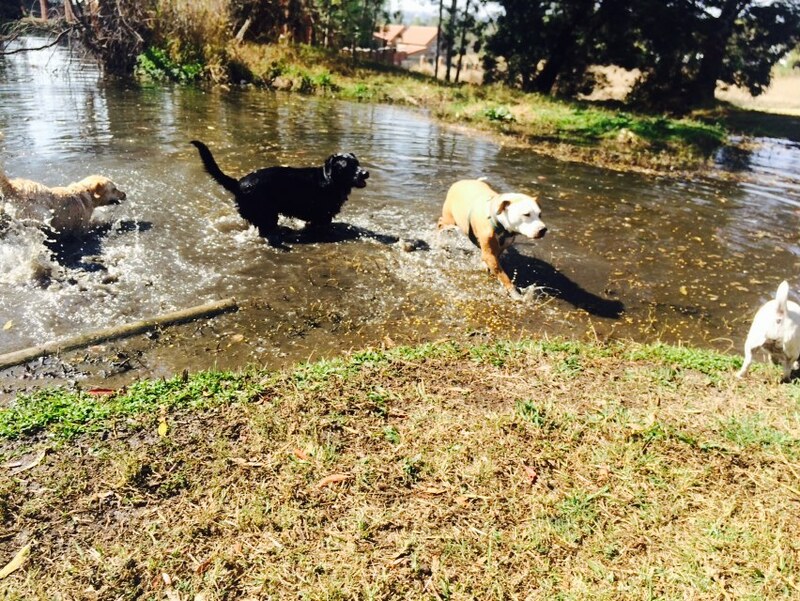 He saw Molly, Sam, Ozzy and Roxy playing in the dam, and decided to test the waters. He was very cautious going into the water, but decided that was a fantastic place to be, and played around with the other dogs. We then decided to see if the pack would like to find a bigger dam, so we moved on to a big field in the park where the dogs could chase each other and look for some new smells. Duke had a fantastic time getting a good run with the energetic Labs. We then moved on the the bigger dam, where we had to climb up some rocks and Duke was so happy to be there. The dogs played in the water some more and terrorized each other before it was time to head back. 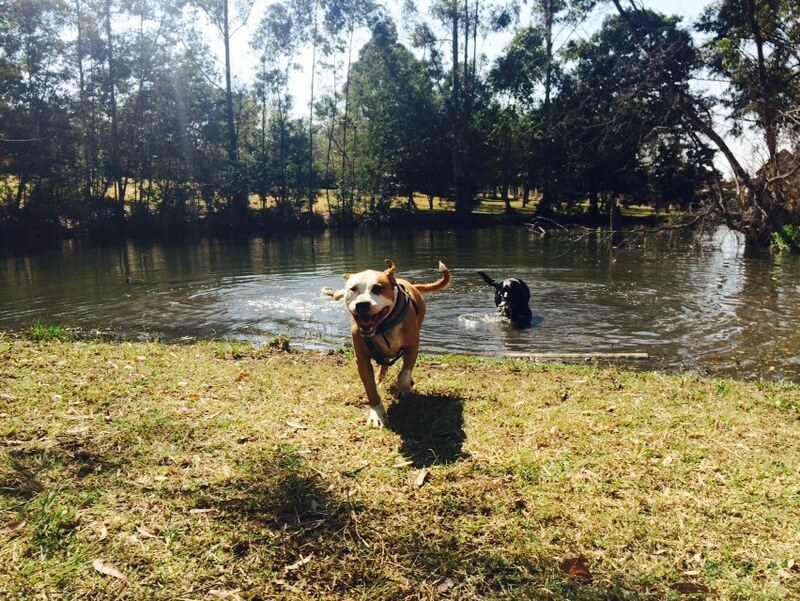 We went back to the small dam for a last swim, before going to take Molly and Sam home. Duke was tired in the car ride home, but very happy to have had such a wonderful time running, jumping, swimming and socializing with the other dogs. It was so lovely to see such happy dogs just enjoying all there is to enjoy. It was a very successful day with the pack at the park, and we can’t wait to bring them back shortly! 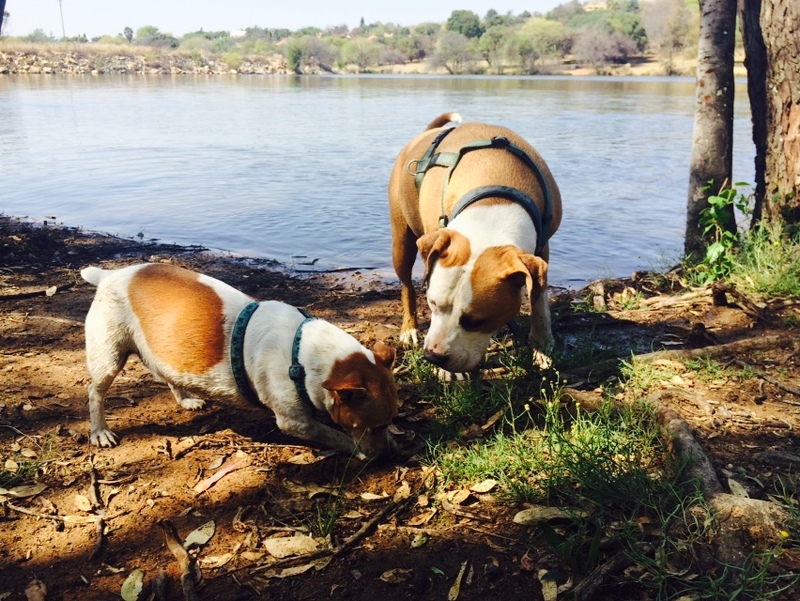 This entry was posted in Dog Walking and tagged #YourHound_SA, animals, Dog walking, dogs, exercise, fit, fun, happy, Happy Dogs, healthy, joburg, Johannesburg, Pets, playing, Socializing, Sunny Johannesburg. Bookmark the permalink.